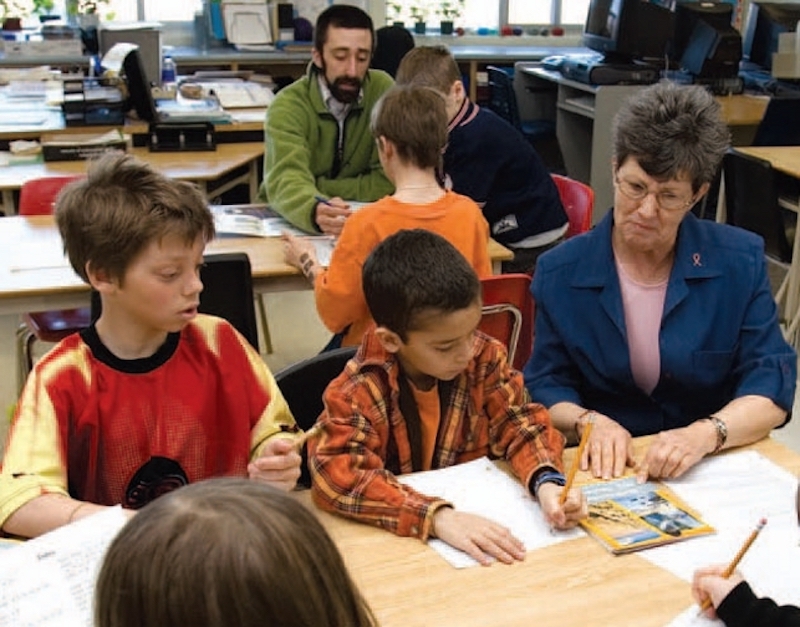 Members of a professional learning community in Kawartha Pine Ridge are discovering that inclusion is good not only for students, but that it benefits teachers as well. Last spring the special education resource team at Newcastle Public School volunteered to participate in a professional learning community project that paired special education resource teachers (SERTs) with classroom teachers. The initiative transformed the traditional role of the SERT with the aim of improving learning for all our students, but in particular for those with special needs. This was a boardwide initiative: we were among 87 teachers at 41 schools in the Kawartha Pine Ridge District School Board taking part. Newcastle PS has been involved in pilot projects for a number of new research-based learning initiatives. We welcomed this project as another opportunity to be “leaders in learning” in our board. We have received two Positive School awards from the Kawartha Pine Ridge ETFO Local, in recognition of our collaborative work and our school spirit. We were fortunate to have several interested staff members with similar professional outlooks and a wealth of experience. Traditionally the special education resource teacher has needed to work with small groups of students in a resource classroom because the students were being withdrawn from more than one class. In this new model, both the SERT and the special needs students are integrated into speciﬁc classrooms. The result is increased teaching capacity in each of these classrooms. To create the teaching partnerships, individual SERTs approached classroom teachers. Newcastle PS has 620 students and three SERTs. Although the emphasis was to be on grades 3 and 6, we were able to also include a grade 1 and grade 1/2 class, giving us two two-person partnerships and one three-teacher team. The grade 5/6 class had 24 students; the other three classes had 20 students each. Each partnership creates its own way of working together. Students work in groups and individually, as appropriate. Special needs students may be in the class for the whole day or just part of it. One teacher may lead the class with the other providing support. One or both may be working with small groups while still other students work independently. Both may facilitate whole-class small group work. The roles are deﬁned by the needs of the students, the requirements of the curriculum, and the teachers’ goals. The SERTs work with all the students in the room and share the responsibility for special needs students with the classroom teacher. We ensure our programs meet students’ needs by varying the way we teach and what we expect of students as they demonstrate what they have learned. The choices we make are based on students’ interests and multiple intelligences. We allow for student choice. Diagnostic assessment guides our instructional practices. With two and sometimes three teachers involved in the planning (we also involve teacher candidates), we ﬁnd we are not lacking in ideas. The increased contact with individual students and small groups of students allows us to see quickly what concepts we need to introduce or reinforce, and enables us to stretch the students’ thinking. Our students’ oral and written reading responses have become more sophisticated. All students beneﬁt from the increased contact with teachers: they cannot ﬂy under the radar or hide in the crowd. An individual student’s difﬁculties can be dealt with immediately, not when the classroom teacher has time or when the resource room is open. Partners can share concerns about individual students’ needs and quickly put in place a plan of action, including accommodations or referrals to other services. Because we work interchangeably with the students, the stigma of “special education kids” is less prevalent. The needs of students who require enrichment are also easily accommodated. Inclusion gives students opportunities for leadership, peer modelling, and support. Members of the PLC within each school meet regularly as a group. We continue to learn from each other. We are able to problem solve and work through concerns together and decide how to tackle new challenges. There are also boardwide meetings that bring together all the participants. Over time we have developed deep respect for and trust in each other. Working collaboratively does present challenges. Both partners must be committed and prepared. Finding additional time to plan together is not always easy. Our busy lives make after-school scheduling difﬁcult and often compromise is required. Making decisions about speciﬁc responsibilities requires good ongoing communication. It also takes time to learn to work together as effectively as possible: the classroom setup, the transitions between activities, and noise management must all be considered. And it helps to have a good sense of humour! The Kawartha Pine Ridge District School Board had speciﬁc goals in facilitating this PLC. But we are convinced that our PLC has been a success because we volunteered to take part, volunteered to be partners, and took ownership of our personal and professional growth. When the project began in the spring of 2006, the board provided professional development sessions focusing on identifying needs and goals, understanding collaborative communities, inclusive programming, and differentiated instruction. Our administration paid for each teacher to attend a Bureau of Educational Research workshop on differentiated instruction. (During a recent professional activity day we shared with our colleagues some of the practical strategies we learned and recommended a variety of professional resources.) Over the course of the project, all participants received ongoing professional development. Each team received $500 to purchase teacher and student resources. Parents have supported the increased integration of special needs students into regular classrooms. They know their children beneﬁt from having an additional teacher in the classroom. Our administrators helped by strategically placing students and by locating partners in classrooms close to each other. As well, they developed teacher schedules that made it possible for partners to have joint planning time. Teaching collaboratively is enjoyable and continues to renew and motivate us. Bonding with like-minded colleagues is not only supportive, but fun. No one laughs more than we do! We delight in sharing student successes. One of our team is even considering deferring retirement because of the new energy this project has instilled. As a team we are excited about continuing our group efforts and expanding the professional learning community here at Newcastle Public School. I didn’t always consider myself a dance educator. In fact, when I began my elementary teaching career I thought of myself as a math and science specialist. It wasn’t until my first professional learning experience in dance education 10 years ago that my mindset shifted about the benefits and value of dance education.